This article is about the New Jersey ecosystem. For other uses, see Pine Barrens (disambiguation). The Pine Barrens, also known as the Pinelands or simply the Pines, is a heavily forested area of coastal plain stretching across more than seven counties of New Jersey. The name "pine barrens" refers to the area's sandy, acidic, nutrient-poor soil. Although European settlers could not cultivate their familiar crops there, the unique ecology of the Pine Barrens supports a diverse spectrum of plant life, including orchids and carnivorous plants. The area is also notable for its populations of rare pygmy pitch pines and other plant species that depend on the frequent fires of the Pine Barrens to reproduce. The sand that composes much of the area's soil is referred to by the locals as sugar sand. The Pine Barrens remains mostly rural and undisturbed despite its proximity to the sprawling metropolitan cities of Philadelphia and New York City, in the center of the very densely populated Boston-Washington Corridor on the Eastern Seaboard. The heavily travelled Garden State Parkway and Atlantic City Expressway traverse sections of the eastern and southern Pine Barrens, respectively. The Pine Barrens territory helps recharge the 17 trillion gallon Kirkwood-Cohansey aquifer containing some of the purest water in the United States. As a result of all these factors, in 1978 Congress passed legislation to designate 1.1 million acres (4,500 km2; 1,700 sq mi) of the Pine Barrens as the Pinelands National Reserve (the nation's first National Reserve) to preserve its ecology. A decade later, it was designated by the United Nations as an International Biosphere Reserve. Development in the Pinelands National Reserve is strictly controlled by an independent state/federal agency, the New Jersey Pinelands Commission. The Pinelands Reserve contains the Wharton, Brendan T. Byrne (formerly Lebanon), Penn, and Bass River state forests. The reserve also includes two National Wild and Scenic Rivers: the Maurice and the Great Egg Harbor. John McPhee's 1967 book The Pine Barrens focuses on the history and ecology of the region. Between 170–200 million years ago, the Atlantic coastal plain began to form. The Barrens formed in the southernmost, and last, area to be formed in New Jersey, 1.8 to 65 mya, the Tertiary era. Over millions of years, the rising and falling of the coastline deposited minerals underground, culminating with the end of the last ice age about 12,000 years ago, when plants and trees began growing in what is now New Jersey. Forest fires have been a common occurrence before habitation by humans. Fire has played a major ecological role in the Pinelands, and the ecotypes "suggest that short fire intervals may have been typical in the Pine Plains for many centuries, or millennia." Around 10,000 years ago, the ancestors of the Lenape people first inhabited the Pine Barrens. The fire regime before European settlement is poorly understood. Scholars know that the Lenape tribes burned the woods in the spring and fall to reduce underbrush, and improve plant yields and hunting conditions. The Pine Barrens, with its sandy soil, did not attract a permanent agriculture population (whose main interest would have been to establish permanent boundaries and clear the forests for fields). The area's sparse population encouraged a long-lasting attitude that forest fires should be set for local benefit—even on the lands of others. For instance, it was profitable for charcoal burners to set fires deliberately, in order to make the trees useless for any purpose other than charcoal making, then purchase the trees for a discount. During the 17th century, the area that is now New Jersey was explored and settled by the Swedish and Dutch, who developed whaling and fishing settlements mainly along the Delaware River. The English claimed the area as of 1606 under their London Company, and the Dutch abandoned their claim to the English in 1664. The first shipbuilding operations began in the Pine Barrens in 1688, utilizing the cedar, oak, and pitch trees, as well as local tar and turpentine. The first sawmills and gristmills opened around 1700, leading to the first European settlements in the Pinelands. During the colonial era, the Pine Barrens was the location of various industries. In 1740, charcoal operations began in the Pine Barrens, and the first iron furnace opened in 1765. Bog iron was mined from bogs, streams, and waterways, and was worked in about 35 furnaces including Batsto, Lake Atsion, Hampton Furnace in Shamong, Hanover Furnace in Pemberton, Ferrago in Lacey, and several other locations. Iron from these early furnaces was instrumental in supplying the American military with weapons and camp tools during the American Revolution, the War of 1812, and the Second Barbary War. For example, Commodore Stephen Decatur, Jr. sailed to Algiers armed with 24-pound cannons that had been cast at Hanover in 1814. The first Indian reservation in the Americas was founded Brotherton in 1758, in what is now Indian Mills in Shamong Township. In 1778 during the Revolutionary War, the British burned and pillaged the village of Chestnut Nuck in a failed attempt to destroy the ironworks at Batsto Village. In 1799 after the war, the first glassworks opened in Port Elizabeth, and by that time, whaling operations had stopped. The first cotton mill in the Pine Barrens opened in 1810 at Retreat. Cultivated cranberry bogs begin in the 1830s, and in 1832, the first paper mill opened in the region. In 1854, the first railroad across the Pinelands opened, connecting Camden and the newly-established Atlantic City. Railroads soon connected the various small towns that existed across the Pine Barrens. In 1869, the bog iron industry ended in the Pine Barrens, after the discovery that iron ore could be mined more cheaply in Pennsylvania. Other industries such as paper mills, sawmills, and gristmills rose and fell throughout the years, catering chiefly to local markets. Smaller industries such as charcoal-making and glassmaking also were developed, meeting with varying degrees of success. Over time, however, the forest reclaimed almost all traces of the Pine Barrens' industrial past. Ghost towns—remnants of villages built around these former industries—can still be found at various locations. Batsto Village has been restored to its mid-19th century state as a state historic site. The Pine Barrens were home to many rural, backwoods families. For years, residents of the rural area were called "Pineys" by outsiders, as a derogatory term. Today many Pinelands residents are proud of both the name and the land on which they live. In the early 20th century, a family identified in a case study by the pseudonym, the Kallikaks, were presented as an example of genetic inferiority by eugenicists. Today, scholars understand that the facts in the Kallikaks study were misrepresented, including photographs altered to make the family members appear more backward. On July 12, 1928, the Mexican aviator and national hero Emilio Carranza crashed and was killed in Tabernacle, New Jersey, while returning from a historic goodwill flight from Mexico City to the United States. Flying back from Long Island, he encountered a thunderstorm and crashed in Burlington County. A 12 ft (3.6 m) monument identifies the location of the crash. Despite rapid urbanization of surrounding areas, the Pine Barrens remained largely untouched because its sandy soil was unsuitable for growing most crops. Its iron and charcoal deposits did not compete with more readily accessible deposits elsewhere. In 1969, the Pine Barrens averaged a density of 15 people per square mile, compared with 1000 people per square mile in the lands bordering it. With rising environmental concerns at the time, people became alerted to the possible destruction of the Pine Barrens and its aquifer by urban sprawl. State authorities in the region discussed plans to construct a jetport and associated city in the Pine Barrens to alleviate congestion at other major regional airports of the mid-Atlantic. The low cost of land and lower incidence of fog in the area made the plan appealing. Congress created the New Jersey Pinelands National Reserve, the country's first National Reserve, to protect the area under the National Parks and Recreation Act of 1978. The reserve contains Wharton State Forest, Brendan T. Byrne State Forest, Bass River State Forest, and Penn State Forest. The Pinelands was designated a U.S. Biosphere Reserve by UNESCO in 1983 and an International Biosphere Reserve in 1988. Howard P. Boyd was instrumental in working to preserve the Pine Barrens and educate visitors. He died in December 2011, within the Protection Area of the Pinelands National Reserve. The Pine Barrens is associated with many legends and tales. The Pine Barrens gave rise to the legend of the Jersey Devil, said to have been born in 1735 to a local woman named Mrs. Leeds in an area known as "Leeds Point". It was said that he was her 13th child and, because of the unlucky number, he was cursed. Another story says that the mother gave birth to a hideous monster that attacked her and her nurses, before flying up and out of the chimney and disappearing into the Barrens. Most alleged sightings of the legendary Devil have occurred in or near the Pine Barrens. 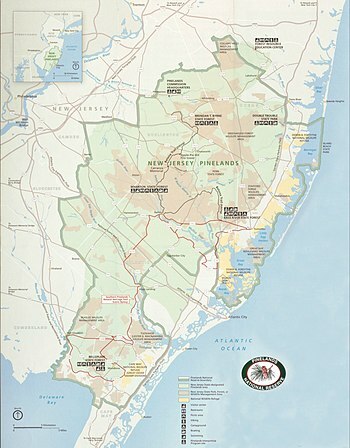 The New Jersey Pinelands National Reserve contains approximately 1,100,000 acres (4,500 km2) of land, and occupies 22% of New Jersey's land area, including territory of much of seven counties. Counties affected by the act are Atlantic, Burlington, Camden, Cape May, Cumberland, Gloucester and Ocean. The Pine Barrens comprise a major part of the Atlantic coastal pine barrens ecoregion. The forest is at risk from increasing development in the area. Although natural fires have occurred, evidence shows that most fires in the region are of human origin. The Pine Barrens of New Jersey are in the transition zone between humid subtropical and humid continental climates. The Pine Barrens, however, have a microclimate that allows for a shorter frost-free season, and colder nighttime temperatures compared to most of New Jersey. Because of sandy soil and very little development, clear and calm nights can get much colder in the Pine Barrens than in the surrounding areas. On an average night, a 6 to 8 °F (3.3 to 4.4 °C) difference is commonly seen, but the change can be as much as 10 °F (5.6 °C). The Pine Barrens receives annual snowfall, varying from 15 to 21 inches (380 to 530 mm) throughout the Pinelands (the northern pinelands receive the most snowfall, on average). Summers are typically hot and humid, and winters are typically cold, and fall/spring are milder transition seasons. Frost can be seen in fall, spring, and winter. In the Pine Barrens, frost occurs earlier in the fall and later in the spring than the surrounding areas due to the sandy soil. The average annual precipitation in the Pinelands is from 42 to 46 inches (1,100 to 1,200 mm), but year-to-year precipitation varies greatly. Thunderstorms are frequent in the warmer months, along with strong winds and heavy rains from these storms. The Pine Barrens is home to at least 850 species of plants, of which 92 are considered threatened and endangered. Several species of orchids, including the Pink Lady's Slipper, are native to the Pine Barrens. The forest communities are strongly influenced by fire, varying from dwarf pine forests less than 4 feet (120 cm) tall where fires are frequent, to pine forests, to oak forests where fires are rare. Dark swamps of Atlantic white cedar grow along the waterways. Forest fires play an important role in regulating the growth of plants in the Pine Barrens. Frequent light fires tend to reduce the amount of undergrowth and promote the growth of mature trees. Forest fires have contributed to the dominance of pitch pine in the Pine Barrens. They can resist and recover quickly from fire by resprouting directly through their bark (something very unusual for pines). Their serotinous pine cones open only after having been heated by a fire. The prevalence of forest fire allows the pitch pines to dominate over oaks, which by comparison are usually killed outright by a moderate or intense fire. High air temperatures and dry plant undergrowth contribute to the intensity of the fire. While severe fires are uncommon, severe fires at fairly frequent intervals can eliminate species that do not bear seed at an early age. Frequent killing fires keep an area covered with small sprouts. Efforts to battle forest fire attract debate over how to best preserve the Pine Barrens. While fires constitute a danger to property and inhabitants, preservationists argue that eliminating forest fires would cause the Pine Barrens to become dominated by oak trees. A few areas which had previously consisted of scrub and pitch pine have become dominated by oak trees because of intervention after settlement to reduce the frequency of forest fires. The Pine Barrens is home to at least 39 species of mammals, over 300 species of birds, 59 reptile and amphibian species, and 91 fish species. At least 43 species are considered threatened and endangered by the NJ Division of Fish and Wildlife, including the rare eastern timber rattlesnakes (Crotalus horridus) and bald eagles. A threatened species of frog, the Pine Barrens tree frog, has a disjunct population there. American black bears are finding their way back into the Pine Barrens after a history of hunting and trapping had driven them out. Believed to have been extirpated from the state by 1970 due to destruction of its territory and human encroachment, the bobcat gained legal protection in 1972. It is classified as a game species with a closed season; in 1991 it was added to the list of endangered species in New Jersey. Between 1978 and 1982, the state introduced 24 bobcats from Maine into the northern portion of the state. Since 1996, they have been monitored by biologists with the aid of GPS transmitters in order to determine habitat ranges and preferences. A scent-post survey in 1995 proved bobcat presence in four northern counties. There have been reliable sightings of the bobcat in nine additional (mostly southern) counties, including those encompassing large swathes of the Pine Barrens and others skirting it, namely: Atlantic, Burlington, Cape May, Cumberland, Ocean, and Salem counties. Industries in the Pine Barrens are primarily related to agriculture and tourism. New Jersey produces the third-highest number of cranberries in the country, mostly cultivated in the areas around Chatsworth, including Whitesbog. The first cultivated blueberries were developed in the Pine Barrens in 1916 through the work of Elizabeth White of Whitesbog, and blueberry farms are nearly as common as cranberry bogs in the area. Most blueberry farms are found in and around the town of Hammonton. The Pine Barrens is the setting and the name of a celebrated episode of TV program The Sopranos. The episode was actually filmed in New York as the production was denied a permit to film in the Pine Barrens. ^ Pearce, Jeremy. "Trouble in Paradise", The New York Times, June 23, 2002. Accessed September 29, 2007. Quote: "The state Pinelands Protection Act of 1979 set goals of preserving farms and undeveloped lands, discouraging piecemeal and scattered development and conserving animal and plant species on the sandy soils of the Kirkwood-Cohansey Aquifer, estimated to hold 17.7 trillion gallons of water." ^ Michael A. Hogan, "The Pine Barrens of New Jersey: A Photoessay", Environment News Service, 27 October 2005. Accessed September 29, 2007. Quote: "Underlying much of the Pinelands is the Cohansey Aquifer. This formation of unconsolidated sand and gravel functions as a vast reservoir estimated to contain over 17 trillion gallons of some of the purest water in the country." ^ "The Maurice Wild & Scenic River". Nat'l Park Service. Retrieved January 20, 2012. ^ "The Great Egg Harbor Wild & Scenic River". Nat'l Park Service. Retrieved January 20, 2012. ^ a b Anderson, Roger Clark; James Steven Fralish; Jerry Mack Baskin (1999). Savannas, Barrens, and Rock Outcrop Plant Communities of North America. Cambridge University Press. ISBN 978-0-521-57322-1. ^ Stansfield, Charles (1998). A geography of New Jersey: the city in the garden. Rutgers University Press. ISBN 0-8135-2579-9. Retrieved August 31, 2010. ^ a b c d Forman, Richard (1998). Pine Barrens: ecosystem and landscape. Rutgers University Press. ISBN 0-8135-2593-4. Retrieved January 9, 2016. ^ a b c d "History". New Jersey Pinelands Commission. Retrieved August 9, 2018. ^ a b "Unique Pinelands Places: Ghost Towns and Ruins". pinelandsalliance.org. Pinelands Preservation Alliance. Retrieved April 1, 2018. ^ "A Listing of the Forges and Furnaces of South Jersey – NJPineBarrens.com". www.njpinebarrens.com. Retrieved August 24, 2018. ^ "National Register Digital Assets: Hanover Furnace". nps.gov. National Park Service. Retrieved April 1, 2018. ^ Ben Ruset (November 24, 2007). "A Listing of the Forges and Furnaces of South Jersey". njpinebarrens.com. Retrieved April 1, 2018. ^ Birdsall, Bob (2007). People of the Pines. Medford, NJ: Plexus Publishing, Inc.
^ Human Intelligence: The Kallikak Family. University of Indiana. ^ "Biography of a Place: Wilderness Thrives Surrounded by City", Columbia Missourian, 26 January 1969. Accessed March 3, 2009. ^ "New Jersey Pinelands Commission | The Pinelands National Reserve". nj.gov. Retrieved May 4, 2018. ^ "Howard Boyd – The Piney", Blog NJ, Quote: "This Tabernacle resident is the pre-eminent scholar on the Pine Barrens." ^ "Legend of the New Jersey Devil", The New Jersey Historical Society. ^ "Indian Mills: Precipitation". Rutgers University. Retrieved March 2, 2017. ^ a b Heavener, Greg (2011). "Microclimate of the New Jersey Pine Barrens" (PDF). National Oceanic and Atmospheric Administration. Retrieved May 8, 2016. ^ "climate.rutgers.edu/stateclim_v1/monthlydata/". climate.rutgers.edu. Retrieved May 4, 2018. ^ Forman, Richard (1979). Pine Barrens: Ecosystem and Landscape. New York, New York: Academic Press. p. 130. ISBN 0-12-263450-0. ^ "Plants". The Pinelands National Reserve. State of New Jersey Pinelands Commission. Retrieved January 20, 2012. ^ "Protection of Threatened & Endangered Plants in the New Jersey Pinelands" (PDF). New Jersey Pinelands Commission. January 2011. Retrieved January 20, 2012. ^ "Blooming Schedule for Pinelands Orchids" (PDF). New Jersey Pinelands Commission. Retrieved January 20, 2012. ^ Dudley, Elizabeth. Forests: A Fact-Filled Coloring Book, 1990, p. 58. ^ Peterson, Iver (May 29, 1992). "Fire in the Pine Barrens: Keeping the Oak at Bay". The New York Times. Retrieved March 21, 2009. ^ "NJ Pine Barrens Animals". pinebarrensanimals.com. Retrieved May 4, 2018. ^ "Threatened & Endangered Animals of the New Jersey Pinelands" (PDF). New Jersey Pinelands Commission. January 2011. Retrieved January 20, 2012. ^ Birdsall, Bob (2008). "Seasons of the Pines". Barnegat, NJ: Island Publishing. ^ a b Hammerson, Geoffrey. "Hyla Andersonii". IUCN Redlist. International Union for Conservation of Nature and Natural Resources. Retrieved January 20, 2012. ^ "Pine Barrens Mammals - Pinelands Preservation Alliance". pinelandsalliance.org. Retrieved May 4, 2018. ^ "Bobcat – March 2003: Species of the Month". New Jersey Dept. of Fish, Game and Wildlife. Retrieved March 3, 2011. ^ "Bobcat, Felis refus" (PDF). Retrieved March 3, 2011. ^ VanDerWerff, Todd (January 19, 2011). "The Sopranos: "Pine Barrens"". Onion Inc. Retrieved December 27, 2016. ^ Press, The Associated. "'Sopranos' Banned From County Property". nytimes.com. Retrieved August 24, 2018. Wikimedia Commons has media related to New Jersey Pine Barrens.